To prepare the crust, mix together graham crackers, melted butter and sugar. Make crust by evenly spreading graham mixture to cover the bottom of a 9-inch pie plate. Insert an 8-inch pie plate on top of crumbs pressing together firmly. Bake for about 8 minutes, then cool. To prepare the filling, combine condensed milk, key lime juice and egg yolks. Use a wire whip to blend well and pour into the baked crust. Bake for another 8 minutes. Freeze for 1 hour before serving. 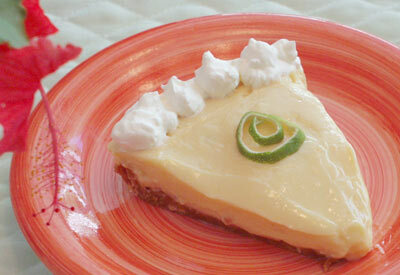 Serve with huge dollops of whipped cream and sprinkle with key lime zest. Refrigerate any leftovers.